What sets apart the most interesting rooms is Individuality—that spark that reveals the personality of the inhabitant. How do you come by that unique spark? The easiest way is by displaying the passions, collections, interests, and treasures you have collected along your journey through life. It helps to think outside the box or—ahem, display case—when thinking about collections. They don’t have to be the typical assemblage of Fabergé eggs or vintage alarm clocks. For example, perhaps you inherited your great aunt’s embroidered cotton handkerchiefs and tucked them away in a closet. Handsomely mounted in matching frames these vintage squares become a statement of yesteryear’s charm. Love hats? A front hallway can be a great spot to showcase your personality in a casual way. 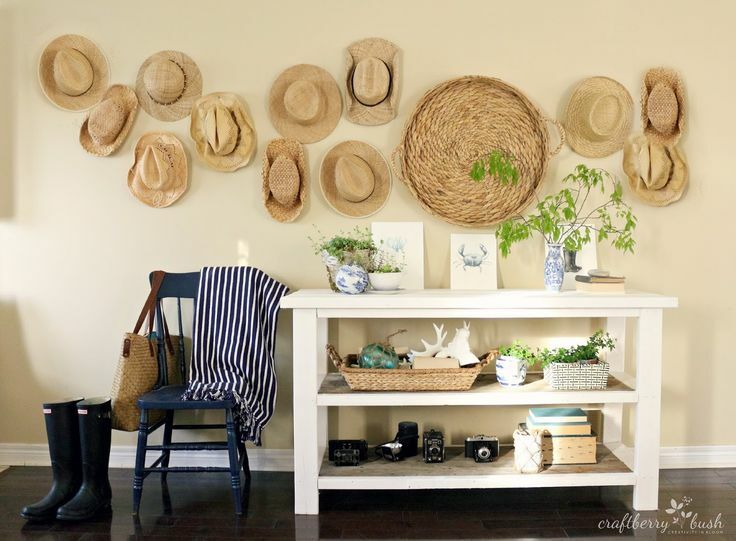 Consider a wall of straw hats on simple pegs. Some people can’t go on a trip without bringing back interesting rocks, sea glass, shells, and other natural totems they find on their journeys. Placing these found objects in a shallow basket or bowl on a coffee table is a simple way of bringing a unique touch to a room. Plus it can make a great conversation starter. Victorians delighted in fussy china cabinets and fancy vitrines. But a display doesn’t require a formal piece of furniture. Here a dressmaker form is home to the owner’s extensive costume-jewelry pins and brooches. Bringing one’s everyday passions, whether it’s hats, rolling pins, guitars or scarves, out of the closet or shoebox and into the open is a brilliant way of introducing color and personality to a home. One trick designers use when composing collections is using a uniform color palette. In this room, simple black chair rails display thrift-store mirrors that have all been painted the same shade of white. Voila. Big charm at little expense. Another successful approach to organizing a collection is to group items by color. Here a rainbow assortment of glassware pops against the simple white shelving in an alcove. Bell jars make ideal repositories for both natural collections (pine cones, seed pods, etc.) as well as other small items such as wine corks, marbles, leather baseballs, etc. These pedestal jars are available at Restoration Hardware and come in various sizes. Any table surface can be the perfect spot to show off treasures. Don’t overlook the power of risers—handy devices that can elevate grouped collectibles to varying heights or set off a solo object.